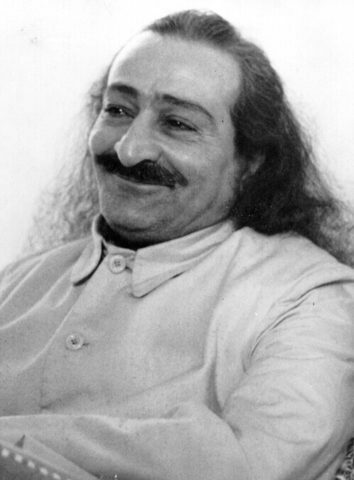 Meher Baba (1894–1969) declared himself to be the Avatar of our age—God in human form, whose most recent advents were as Muhammad, Jesus, Buddha, Krishna, Rama, and Zoroaster. Born Merwan Sheriar Irani to a Persian Zoroastrian family in Pune, India, he was awakened to his divinity at the age of 19 when kissed on the forehead by Hazrat Babajan, an old Muslim woman revered as a perfect master. Four other masters—Shirdi Sai Baba, Upasni Maharaj, Tajuddin Baba, and Narayan Maharaj—also played a role in his “unveiling,” after which Merwan became known as Meher Baba (“Compassionate Father” ). Meher Baba’s followers — whom he called “Baba-lovers” because the quickest of the High Roads to God lies through love for the Avatar, who is consciously one with the Truth — include men and women of all nationalities, races and ethnic groups, and religious backgrounds. For a more complete biography of Meher Baba, see the Wikipedia article. Please see the Online Library at the Avatar Meher Baba Trust site, where books by and about Meher Baba can be downloaded free as pdf’s. Love Street Breezes, ed. Dina Snow Gibson. Get a free pdf of the premier issue. Om Point Circular, ed. Laurent Weichberger: free pdf of all issues.